Runner’s knee or jumper’s knee are conditions that commonly occurs in young, active individuals. 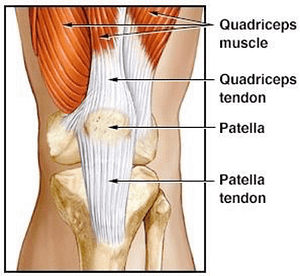 Both can be categorized into a larger set of injuries that effect the patellar tendon and cause what is known as Patellofemoral Pain Syndrome (PFPS). In order to learn more about these conditions, let’s discuss related anatomy, symptoms, causes and treatments. The patella, or kneecap, is the bone that covers and protects the knee joint. It’s attached to the femur by the quadriceps tendon and the tibia by the patella tendon. A small fat pad is located underneath the patella and soft tissue and bone surround it. When the fat pad, tendons, tissues, or bones associated with the patella are overused, a patient is said to have runner’s/jumper’s knee. A dull, aching pain around the front of the knee is the most common symptom of runner’s or jumper’s knee. This pain usually gets worse with increased physical activity. When left untreated, pain can reach the point where an affected patient might have to stop physical activity. Once the has been diagnosed by an orthopedic specialist, a relatively simple, straight-forward treatment program is prescribed. Activity modification. Slowing down or stopping sports/activities that cause pain gives the knee a chance to heal. Once pain goes away, sports/activities can be resumed. Non-steroidal anti-inflammatory drugs (NSAIDs). Like ice, NSAIDs calm down inflammation and decrease pain. Physical Therapy. Stretching and strengthening the muscles, tendons, and ligaments of the knee decrease pain and prevent future injuries. Any combination, or all of these treatment options can be prescribed by an orthopedic specialist. In rare instances, there may be significant damage to the tendon that needs to be repaired. In most cases, this repair can be performed arthroscopically with patients returning home the same day as their procedure. If you’re experiencing knee pain that won’t go away, you might have runner’s/jumper’s knee that’s needs to be professionally treated. Please contact our office to arrange an appointment with one our orthopedic specialists. The road to recovery begins when you walk through our doors. High Mountain Orthopedics specializes in bone, joint and muscle injuries- including knee injuries. Dr. William Matarese Dr. Tony Wanich and Dr. Sherwin Su have over 25 years of combined experienced treating orthopedic and sports injuries. Our practice uses a multi-disciplinary approach that includes physical therapy and activity modification. If surgery is necessary, our team utilizes the latest advancements in Minimally Invasive and Arthroscopic procedures to expedite the healing process. If you are suffering from a bone, joint or muscle injury – contact our offices today! We have locations in Wayne, Clifton and Englewood, NJ.